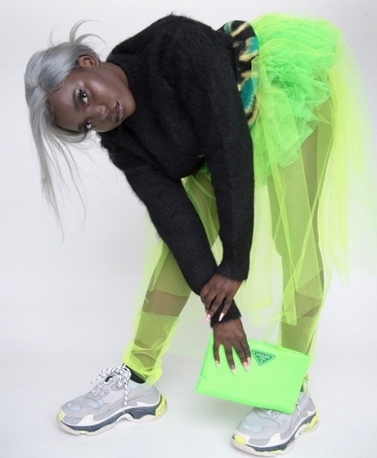 Hypebae has ordained that neons — slime green, specifically — are an absolute staple for Fall/Winter 2018, and where Hypebae leads we will follow. The pop of color stands out equally well against the last vestiges of foliage, and the (eventual) snow. Coordinated separates are an amazing, easy way to look pulled together with minimal effort. Bonus points for an oversized blazer. This may be the look that finally gets us on board with baggy khakis. A cinched waist and lots of layering means it comes across as effortless, rather than cool-mom-at-the-block-party chic. Highs in the 40s have us ready to embrace our super tall snowman alter egos. We also can’t help but love the super clean color scheme of this photo. If puffers aren’t your speed, this brightly colored duster is also warming our hearts. 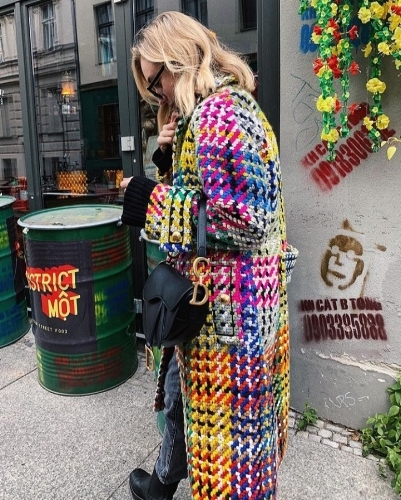 It’s part amazing technicolor dreamcoat, part old grandma quilt, and all funky and fun. This holiday season, Vogue is advocating switching out your glitzy party dresses for some stunning suits and fun, glam accessories. We always love powerful women in powerful suits, and while we may not know exactly what the funky flashy net thing is, we love that too. This may not be the most practical look on our list this week, but it is absolutely a showstopper. It takes a lot to make a shapeless pile of black tulle look this good. For all of us with co-ops looming in January, here’s some office outfit inspo. We love the professionalism of the blazer and tie, plus the playfulness of the sparkly, sheer socks.